Looking for a quick way to stop nausea from anxiety and the sickness of a nervous stomach? Let me show you how. I’m sure you know that feeling, the churning in the stomach, the butterflies, the concern that you might puke or some people even have a worry that they might not puke and that the feeling might never go away. Whatever it is, if it’s nausea and you know that it’s caused by anxiety, I have a really good solution for you. 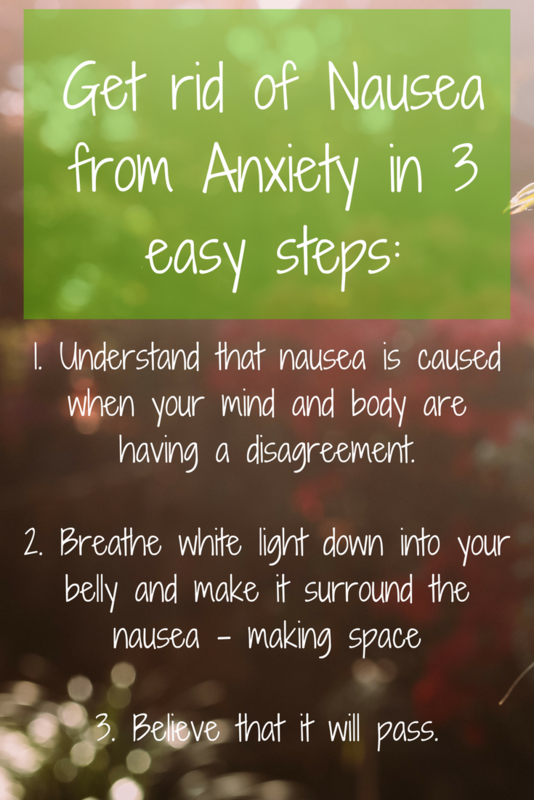 Step one in my solution is just understanding and knowing that nausea from anxiety is caused when your mind and your body are having a disagreement with each other. As an energy healer, I come across this all the time, people having all sorts of symptoms in their bodies that are due to anxiety or their energy generally being out of alignment. Your body and your mind and your spirit, they all require certain things to feel 100% happy and to talk to each other. And sometimes, when things get a little bit unbalanced or off-track, the communication between your mind, your body and your spirit can get off track a little bit and your body and your mind might stop talking to each other. Or your mind and your spirit might stop talking to each other. The way that this manifests is in your body, you start feeling physical symptoms and nausea is definitely one of those. So, you know what you’re doing when you get nausea – often it’s because you’re about to do something that you find quite stressful. Sometimes, people find before they’re about to give a speech or run a meeting or do something else that’s stressful, perhaps driving, they get that horrible churning feeling in their tummy and worry that they might throw up. Step two is just making space around that feeling. I know it’s hard and I know that when you’re experiencing nausea from anxiety, it can be really hard to visualize that feeling when all you want is just relief from this terrible sensation. But I just ask you to stick with me and to follow me as you imagine that churning feeling in your stomach visually. And then you bring white light down into your stomach to make space around that churning nauseous feeling. 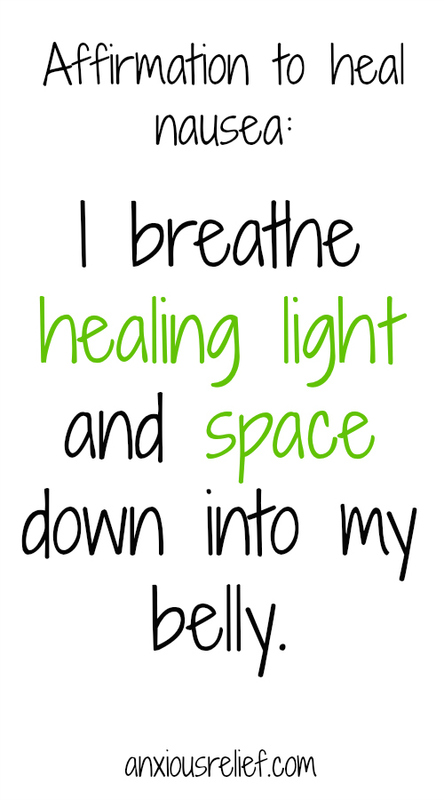 The best way to bring white light and space around a churning stomach is to simply breathe it in deeply down into your tummy and then while you’re doing that, visualizing white light around the churning and then breathing that white light out. And as you breathe out, that space that you inhaled, remains. So you don’t get rid of nausea from anxiety by fighting it but you allow it to remain but you bring space around it. The best way to do that is by breathing it in. So, breathing in white light down into your belly, making space, breathing that white light out again but the space remains. Time is what will really carry this nausea from anxiety away. What I’ve taught you in today’s blog is really a coping mechanism for getting you through the anxiety and the nausea as it’s affecting you. So it’s a good way to give you the power over the feeling and it allows you to do something with that energy, to do something with that feeling which actually is a really good diversion. But longer term, just now that making space around the block that’s there, making space around whatever the issue is that’s causing your mind and your body not to completely align and not to be on track together is breathing the white space in there, that is what will heal it. I have a free energy healing mp3 called Space Between Your Brain Cells and it’s about bringing white light into your mind but you can use that equally as well to bring white light down into your tummy and to put space around that churning nauseous feeling while it’s bothering you. I hope you feel better soon, my Butterfly.